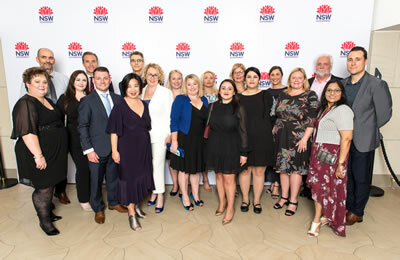 HealthShare NSW, and Patient Transport Service (PTS) in particular, had reason to celebrate in December winning not one, but two awards, at the 2018 NSW Health Awards. The first award, Delivering Integrated Care, recognised the outstanding efforts in creating a single, standardised patient transport service. Beginning in 2014, PTS took a fragmented and ineffective non-emergency patient transport service and transformed it into a service that provides more timely access to care for NSW patients, frees the NSW Ambulance emergency fleet to provide more incidents of life saving care and assists patient flow through hospitals. In her acceptance speech, Jenny Van Cleef, A/Executive Director, Clinical Support Services and former manager of PTS, acknowledged the contribution from all Local Health Districts and NSW Ambulance to ensuring the success of the project. In another display of collaboration, HealthShare NSW won the Safe and Health Workplace Award for the joint PTS and Work Health and Safety (WHS) project, ‘Reducing Injuries in a Mobile Workforce’. In May 2017, PTS had a high Lost Time Injury Frequency Rate (LTIFR), mostly from manual handling tasks associated with the job. To address this, PTS and WHS took a broad ranging approach to improving workplace safety through prevention strategies, improved workplace injury management, and creating a culture that values safety. As a result, PTS lowered its LTIFR by 44% in 12 months.